The heat and haze hung heavy over Sakhalvasho today, as project participants kicked off the first day of the Batumi Raptor Count 2011. Much work lies ahead of us in the next two months, but the thrill of counting raptors in this very special part of the world is already apparent. What has also again become apparent is the warmth and incredible hospitality of the Georgian people, who have welcomed us onto their land and into their homes. From 2011 onwards BRC relocated its headquarters to the homes of several villagers living on the very hill where the first counting station is situated. It would not be an understatement to say that their support is what makes this count possible in the first place. Georgia is living up to our expectations once more! 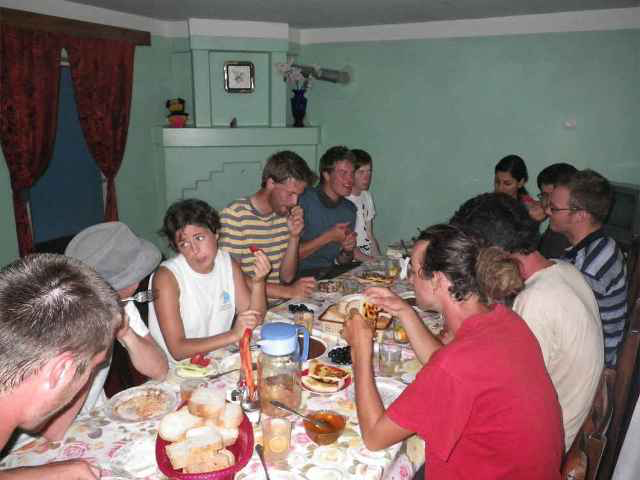 After the count, project participants got together to discuss the day over dinner. If Georgian hospitality wasn’t famous enough, the seemingly endless servings of delicious, homegrown Georgian food, much of it made within this very neighborhood, are difficult to pass up. Fresh honey harvested by our neighbours, cheese and butter from the cows of our host family, and the most organic fruits and vegeteables imagineable from the gardens around us .... BRC participants will not be starving for stimulating company or excellent food in the weeks ahead! With this first update on the 2011 season the BRC Team likes to express it's gratitude for the volunteers, coordinators and students that will be participating in the counts. Over 60 people will join us in Batumi this year! The same of course goes to our host families! Looks like BRC2011 is right on track to achieve its major goal this year: to teach and learn in an international company of amateurs and experts about raptor migration, and to do so in strong cooperation with the local people. We will be keeping you up to date on the proceedings of this autumn season over the course of the next weeks and months.